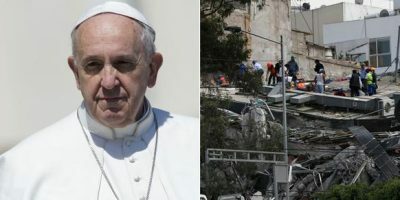 Pope Francis is sending ?150,000 to families in areas of Mexico worst hit?by this week’s earthquake?which has claimed at least 273 lives. His invention came after a 7.1-magnitude tremor struck on Tuesday lunchtime, toppling scores of buildings in central states and in the capital, Mexico City. Described by the Church as an “initial contribution”, the payment will be made via the Holy See’s new Dicastery for Promoting Integral Human Development department. Searches for those missing in the disaster have entered their fourth day, with delicate efforts to rescue people thought to still be alive under debris. Three people have been rescued from a seven-storey office block which collapsed in Mexico City. Officials previously said approximately 14 people could still be trapped inside. The office for the President of Mexico Enrique Pena Nieto confirmed on Thursday there had been 137 deaths in Mexico City, 73 in Morelos state, 43 in Puebla, 13 in Mexico state, six in Guerrero and one in Oaxaca. Navy Assistant Secretary Enrique Sarmiento announced reports of a girl alive underneath the rubble of Enrique Rebsamen school in southern Mexico City were false. It has emerged eleven people from the same family were killed at a church in central Mexico when a major earthquake struck on Tuesday. The family were attending the christening of a baby girl at the Santiago Apostol church in Atzala, Puebla state when the building collapsed. Mr Sanchez was among only three people to survive the church collapse on Tuesday lunchtime. The girl’s father and a priest also escaped. Four children are among the dead. The incident prompted people to arrive at the scene with shovels, pickaxes and chains for helping clear the debris. Across Puebla state, more than 40 people are now known to have died. The nationwide death toll from the 7.1-magnitude tremor has been raised to 230, while rescue workers in Mexico City (pictured above and below) continue frantic yet delicate efforts to rescue a young girl alive under the rubble of a collapsed school. According to the city’s Social Development Department, 52 people had been retrieved alive from debris left in the wake of the disaster, the second major earthquake to strike Mexico in a matter of days. A World Vision worker in Mexico City has told Premier of his horror when a major earthquake struck near the Mexican capital, killing hundreds of people. Victor Martinez from the Christian humanitarian charity described how he was working from home close to the international airport when walls started shaking. According to the US Geological Survey, the earthquake epicentre was close to Raboso in Puebla state, approximately 76 miles southeast of Mexico City. World Vision has been arranging a team of volunteers to establish shelters in areas affected by the 7.1 magnitude tremor which struck on Tuesday lunchtime. The organisation is also mobilising rescue teams and offering food to those working through the night to free survivors from piles of debris. Explaining their focus on caring for children, Mr Martinez added: “We will be assessing with local authorites the possibility to establish child-friendly spaces where our staff will provide emotional recovery”. The earthquake is?the second serious tremor to hit Mexico in two weeks?and came hours after the nation held a silence to remember victims of quake exactly 32 years ago. The President of Mexico Enrique, Pena Nieto visited a school late on Tuesday which collapsed in Mexico City, killing at least 22 people.